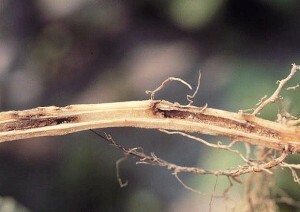 Wireworms (the name for the larvae of a family of beetles commonly known as click beetles, Elateridae) damage tobacco by tunneling into the stalk below the soil surface. This may kill or stunt plants and possibly open even resistant varieties to soil-borne diseases, although data on this relationship is limited. Stunting and the need to reset plants can result in an uneven, costly, and difficult-to-manage crop. Under good growing conditions, tobacco usually recovers from wireworm damage with little to no yield loss. However, if conditions are less favorable or if certain diseases are present, yield may be reduced. Wireworms are already present in the soil at transplanting (eggs are laid on the soil in the summer and early fall of the previous year). It is not possible to control wireworms with post-transplanting rescue treatments; growers must decide in advance whether you need to use soil-applied insecticides. If there is a history of wireworms, if the field was weedy or fallow, or if the field is heavily infested with soil-borne diseases such as black shank and Granville wilt, a preventive treatment is probably justified. In other cases, the decision is less obvious. Insurance treatments for wireworms add to the costs of production and add pesticides to the environment. Either contact insecticides (Furadan, Lorsban, Mocap, Capture) or systemic insecticides (Admire, Platinum, Brigadier) can be used for wireworm control. Both types have provided good control in tests, but the systemics also provide control of aphids and flea beetles. Whether you choose a contact or a systemic, application techniques are important. (1) Broadcast materials should be thoroughly incorporated in the top 6 inches of soil (this usually requires two passes with incorporation equipment). It is also important to give broadcast insecticides time to work before transplanting; at least 2 weeks are recommended unless the label says otherwise. (2) For systemics applied in the greenhouse, apply materials evenly and wash them off thoroughly to move the insecticide to the potting soil. (3) For transplant water treatments, carefully check the calibration of setters and be careful not to let concentrations (rates) build up when refilling partially empty water tanks. 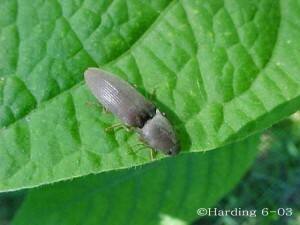 This is particularly important with more concentrated formulations of insecticides. Contact and systemic insecticides for wireworm control should not be combined as the benefit of these is not additive. When selecting soil-applied insecticides, always consider the possible effect on groundwater and surface water. Soil dwelling entomopathenogenic nematodes and fungi may infect wireworm larvae. Limited trials with commercial versions of these biological control agents in other crops have shown variable results. 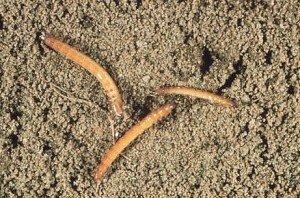 This document from Virginia Cooperative Extension provides information on wireworm management in Virginia potatoes, including information on nematode and fungal biological control agents.